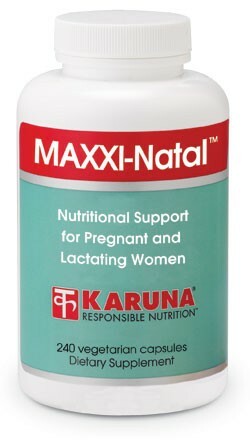 MAXXI-Natal is formulated to provide a specific combination of vitamins and minerals for pregnant and lactating women, including iron and folic acid. Additional zinc is included, as supplemental iron can inhibit zinc absorption. Generous amounts of calcium are provided in the same 2:1 citrate:malate ratio found optimal in clinical studies, along with additional minerals that are co-factors for bone health. Rutin, a bioflavonoid, is included for venous and capillary support, as is B6 for nausea. Suggested use for adults: 4-8 capsules daily, taken in divided doses with meals, or as directed.